Concept of DSS : A decision basically is a resources allocation process that is irreversible, except that a fresh decision may reverse it or overrule the earlier one. We can also define it as a reasoned choice among alternatives. The decision maker, having authority over the resources being allocated, makes a decision. He makes the decision in order to further some objective, which is what he hopes to achieve by allocating the resources. The decision might not succeed in achieving the objective. One might spend the funds and yet, for any number of reasons, achieve no acceleration at all. For example: To accelerate an R&D program is an objective, not a decision. To allocate the funds in an effort to accelerate the program is a decision. Simple decision is one in which there is only one decision to be made, even having many alternatives. A decision may be goal oriented for some degree of satisfaction for a given objective. Objective may be driven by a decision but goal is always target/result oriented. A decision may employ decision analysis; a structured thought process to attain desired results. In doing this, we can distinguish three features of the situation: alternatives, uncertainties and outcomes. Decision analysis thus constructs models, logical or even mathematical, representing the relationships within and between the features of situation. The models then allow the decision maker to estimate the possible implications of each course of action that he might take, so that he can better understand the relationship between his actions and his objectives. Someone who buys a lottery ticket and wins the lottery obtains a good outcome. Yet, the decision to buy the lottery ticket may or may not have been a good decision. 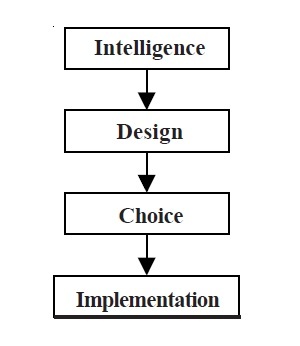 Decision maker may adopt strategy, which is a collection of actions. The outcome of these actions may be uncertain, but the possible outcome is attainment of that goal set by the decision maker. It is necessary to mention about the risk at this juncture that a decision maker often thinks while taking the decisions. Risk can be defined as the possibility of an undesirable result. The risk is linked with monitory benefits or loss and thus, it can be governed by risk tolerance, an individual’s attitude toward decision and the risk involved. With the above background, we can now easily distinguish between strategic and tactical decisions. Strategic decision affects entire organization or major part of it vis-à-vis organizational objectives and the policies. It has long lasting effect on the organizational system and generally taken at the highest management level. On the other hand, tactical decision or management control decision affects a part of the organization for a restricted or short time. The tactical decision takes place within the context of existing strategic decisions. Thus, the contextual and effective management depends on good and timely information. The decision making process may use various techniques depending on the situation. We can define decision making as an activity of deciding appropriate action in particular situations. With relevant and useful information the decision-making may reduce the uncertainty. The quality information is a component that is dependent on the good datasets. • relevance to the decisions being made. The importance of these factors depends on the nature and impact of the decision. For example, in a manufacturing organization, the decision on the budgetary provisions for advertisement depends on the accurate and up-to-date data of sales of the product. • Implementation: the chosen alternative is implemented and substantiated to the stakeholders in the organization. 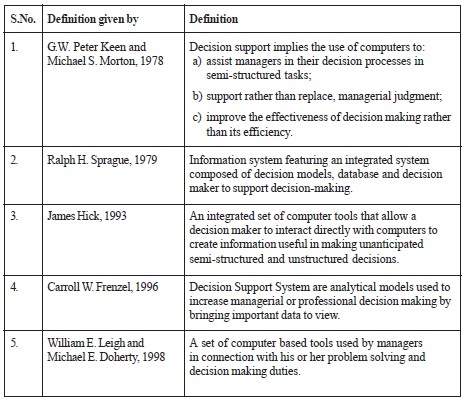 7) decision support systems incorporate models. 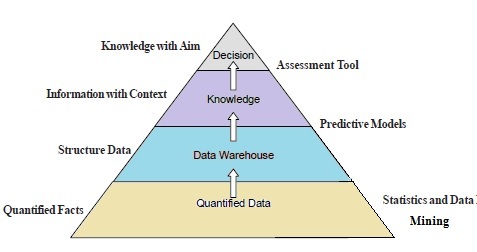 As can be seen, the decision knowledge emerges from the quantified data using statistical and data mining tools, predictive models and the assessment tools. The basic model of a DSS might be a spreadsheet containing the data. The user may make changes in some of the parameters of spreadsheet and observe the impacts on the outcomes. For example, one may create a spreadsheet to support various investment decisions or an individual may create a spreadsheet to model a home loan and see the impact on repayments of changing parameters like interest rates, principal size and the term of the loan. Another example could be from an education institution. A university may create a spreadsheet while entering into a contract with another offshore educational institution to provide its degree programs available in different locations. The spreadsheets then can be used to understand the set of costs, fixed and variable, and to compare its income in a range of circumstances, like student numbers, the impact of money exchange rates or delivery cost depending on the mode, etc. This allows for sensitivity analysis and risk management. More sophisticated DSSs are often systems in their own right, although they may be add-ons to some existing transaction processing system. 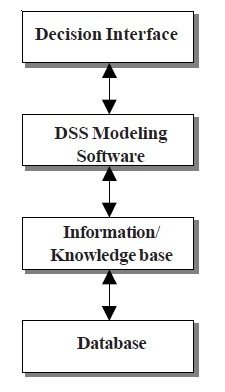 Let us examine basic components of a DSS model through Figure 3. The Figure 3 clearly defines that the data likely to be derived from a database underpins the information on which good decisions are made. Hence, the database is the base component of a DSS model. The information or knowledge base contains information about the intricate relationships that may exist between the data. This defines the rules that underpin the various knowledge systems or the relationship among the activities. For example, the relationships could be between costs, demand and profitability in a product costing.